In a paper published in the journal Nature this week, Rutgers researchers Joachim Messing, Rémy Bruggmann, and a team of international collaborators have described the genome of sorghum, a drought-tolerant African grass. The findings could one day help researchers to produce better food crops for arid regions with rapidly expanding human populations, such as West Africa. Messing, director of the Waksman Institute of Microbiology at Rutgers, The State University of New Jersey, has been deeply involved in both the rice genome and maize (corn) genome sequencing projects. In 1982, he developed the modified shotgun sequencing approach used in the sorghum sequencing that represents a significant advance in methodology. This approach takes into account the highly repetitive nature of large genomes including many plant species and the human genome. By using paired sequence reads instead of single sequence reads, the scientists can jump over repeat sequences, constituting about 62% in sorghum, and produce an accurate and contiguous picture of the entire sorghum genome. "I was very pleased that our earlier DNA sequencing concept has worked so well with an important genome like sorghum," Messing said. "The efficiency and utility of this method will make it faster and far less expensive to sequence other complex genomes in the future." The investigators chose sorghum, which is in the same family (grasses) as maize, rice and wheat, because of its importance for civilization. "We are interested in it for food and animal feed, and more recently as the basis of a biofuel," Messing said. In the United States, sorghum is mainly used as feed and it is grown in the south because it tolerates drought. One variety, known as grain sorghum, is a food staple in places such as Africa and India. According to Daniel G. Peterson, another of the paper's senior authors, sorghum is higher in protein and lower in fat content than maize and is close to maize in nutritional content. Its resistance to heat and water stress allow it to be grown in regions where corn or other grain crops cannot compete. Another variety – sweet sorghum – has a sweet stem and is thus similar to sugar cane. 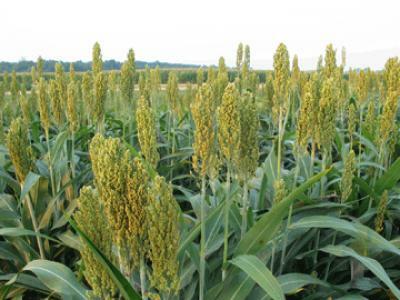 The Food and Agriculture Organization of the United Nations has introduced sweet sorghum in China because of the country's interest in having a biofuel crop and its ability to grow in areas where corn would not. Brazil's extensive biofuel economy is based on sugar cane and is regarded as the most productive biofuel crop in the world. Sweet sorghum rivals sugar cane for this application and sorghum is superior to corn as a biofuel since the entire plant may be used, not just the grain – the kernels of corn. "We now will have a better idea of how many properties of the grasses, such as drought resistance, sugar in the stem, or grain productivity are encrypted in their genes," Messing said. "Knowing this may enable us to laterally move these genes around among these crop species, to customize them based on the needs of geographic location and climate."